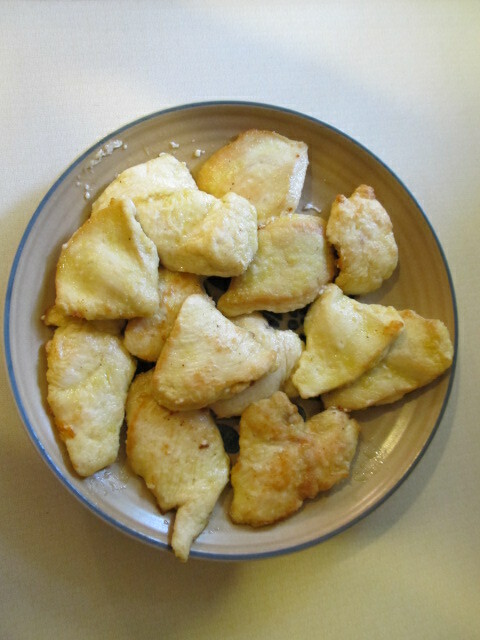 Here is another dish that I made up on my own which is simple enough to make during the work week. Fresh zucchini is available all year but local zucchini can be found later in the summer in northern regions. The quantities in this recipe are flexible depending on the size of the zucchini and how much spaghetti you like in a serving. For me, the recipe below makes two generous servings. The cooking time for this dish is fairly quick and prep may be done while the water for the spaghetti is being heated. Part of the timing of this dish is dependent on how long the spaghetti takes to cook and how tender you like your pasta. Set a pot of water on the stove to come to a boil. In the mean time, rinse and dry zucchini and trim off the ends. Slice up and set aside (use a plate or bowl to hold zucchini now and the cooked zucchini later). Dice up the chicken breast and season with salt. Heat 2 tablespoons olive oil in a large non-stick pan over medium high heat. Press one garlic clove into pan and mix around with the oil. 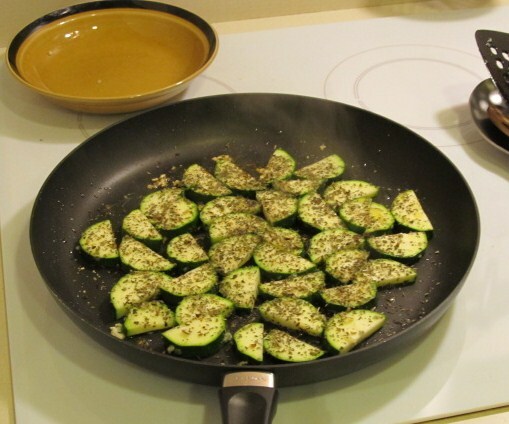 Toss zucchini into the oil so all pieces are coated then try to arrange in a single layer. Put pasta in the water. Set timer. After a 2-3 minutes turn zucchini over. 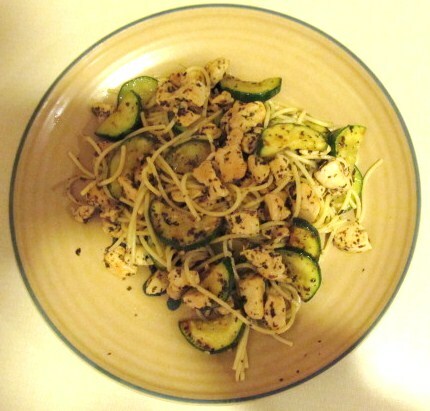 After 2 more minutes remove zucchini from the pan. Put another tablespoon of oil into the pan. Press in the 2nd garlic clove into the pan. Add chicken to the pan and mix around so pieces are evenly spread. 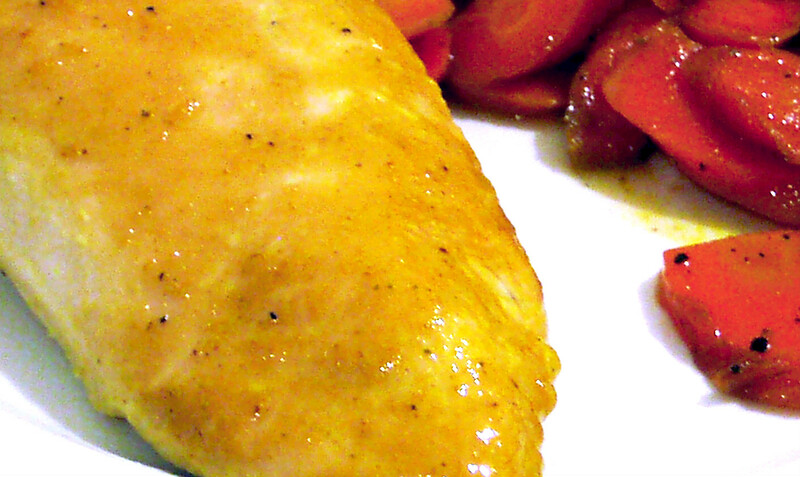 Sprinkle chicken with a generous amount of oregano. Drain the pasta. Pour a little olive oil into the pasta and mix it around. Add to frying pan and toss everything together. Turn off heat. Top with a generous amount of grated parmesan. 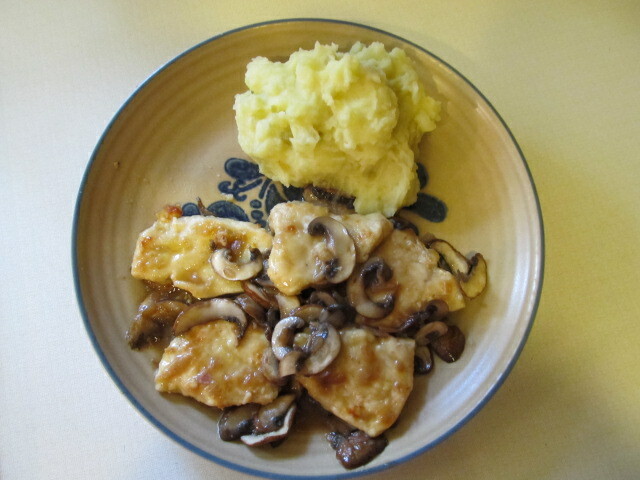 Chicken Marsala is a classic dish that is well liked and easy to make. There are many ways to make it; I have several ways myself. My varieties almost all have the same ingredients with the difference being how little effort you want to take and whether you want to serve it immediately or not. The recipe follows the common cooking approach of sautéing cutlets coated lightly with seasoned flour, followed by sautéing mushrooms and creating the sauce. My little twist is that I add diced shallots to the mushrooms. The variations come into play on the last steps. Do I do it by the book by correctly sautéing the mushrooms, removing them from the pan, then adding the wine, letting it reduce way down, and then adding chicken stock? Or do I just start sautéing the mushrooms and throw in the wine after a little while, then let it liquid reduce down until I think it’s ready? Do I place the chicken in a glass baking dish and throw the sauce (not as reduced) over the top, cover, and place in the oven where the sauce will reduce down or get totally absorbed? Or do I add butter or flour to the sauce to thicken it so I can serve immediately? It’s ALL good though some are better. Experiment. Because it is a simple dish, over the course of the year try making it different ways until you find what works for you. A minor note about the wine. I never have measured the wine when I make this dish. I just pour until I think it’s the right amount. If you are uncomfortable with that idea, start with a cup and add more if you think you should. And yes, I use the cheap marsala but you are welcome to buy a better grade of wine. Using a sharp knife, trim the boneless chicken, then horizontally slice the chicken to achieve thinner pieces of a more uniform thickness (or thinness in this case). You may want to cut some of the pieces in halves or thirds to get smaller, more manageable pieces. In a non-stick skillet or pan, heat about 2 tablespoons of olive oil over medium high heat – enough to sauté the chicken with. This will vary depending on the size of the pan. Add more oil before sautéing a second batch of chicken. Sauté chicken until lightly golden on each side. Depending on thickness, you may need to cook a little longer. Or if you are going to bake the chicken in the oven, you can err on the less done side since the chicken will be cooked further. As each chicken piece finishes cooking, remove from the pan and place on a plate or a glass baking pan or casserole (if doing the oven approach). Add more olive oil when you add new pieces to the pan. Cover the plate with aluminum foil to keep the chicken warm while you prepare the rest. Lower heat to medium. If necessary, add a little more olive oil to the pan. Add shallots to the pan, a sauté them for a couple of minutes to begin softening, at which time you can add the mushrooms. Sauté mushrooms until done. Remove from pan (place on top of chicken for ease). 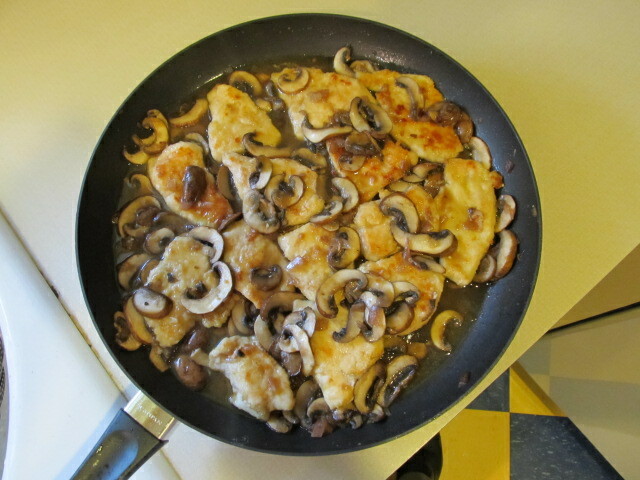 If serving immediately, place the chicken and mushrooms back in the pan to warm back up a bit (a minute or two). Then remove chicken and cover with sauce; extra sauce can be served on the side. Reduce liquid until you have the amount of sauce you want. Lower heat a little and add slurry; cook a couple of minutes more so the sauce thickens. When the mushrooms have softened and sauce has reduced somewhat, pour sauce over chicken.